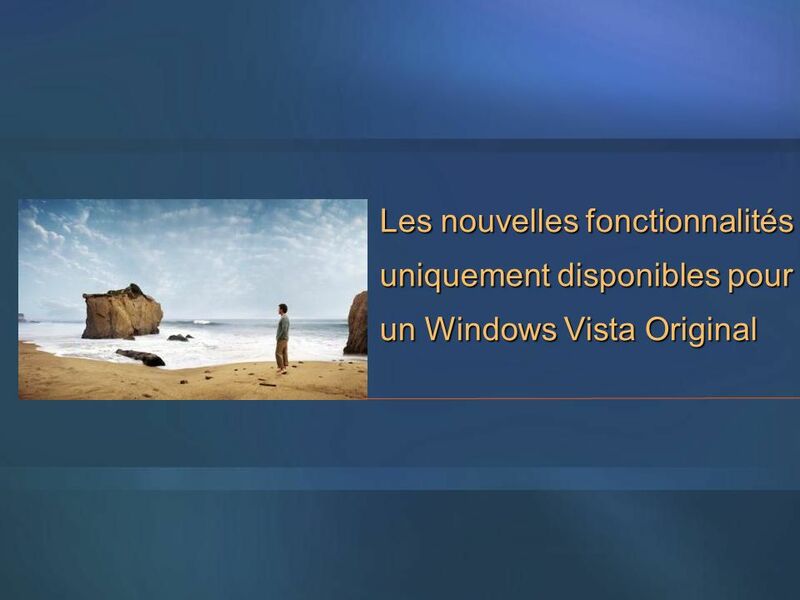 3/26/2017 3:54 PM Les nouveautés de l’activation Nicolas Mirail Chef de produit Windows Vista Division OEM Microsoft France © 2006 Microsoft Corporation. All rights reserved. Microsoft, Windows, Windows Vista and other product names are or may be registered trademarks and/or trademarks in the U.S. and/or other countries. The information herein is for informational purposes only and represents the current view of Microsoft Corporation as of the date of this presentation. Because Microsoft must respond to changing market conditions, it should not be interpreted to be a commitment on the part of Microsoft, and Microsoft cannot guarantee the accuracy of any information provided after the date of this presentation. MICROSOFT MAKES NO WARRANTIES, EXPRESS, IMPLIED OR STATUTORY, AS TO THE INFORMATION IN THIS PRESENTATION. 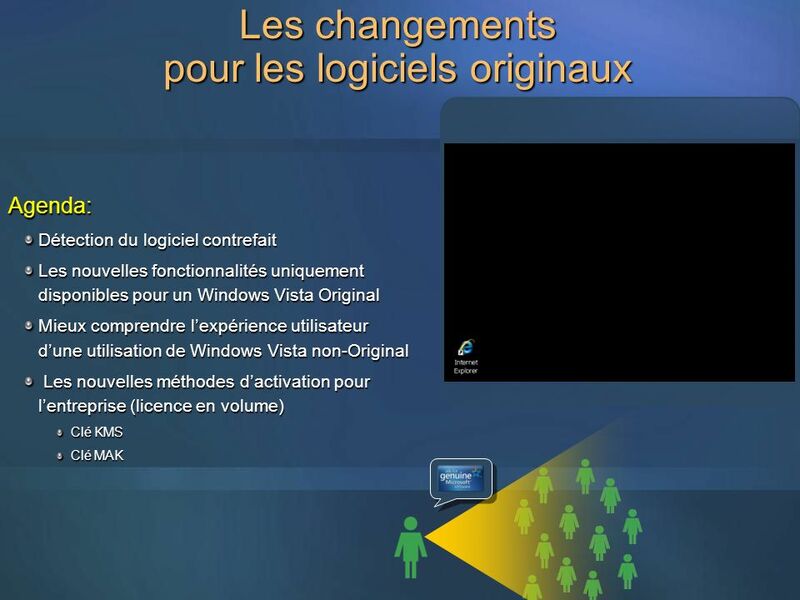 3/26/2017 3:54 PM Agenda: Détection du logiciel contrefait Les nouvelles fonctionnalités uniquement disponibles pour un Windows Vista Original Mieux comprendre l’expérience utilisateur d’une utilisation de Windows Vista non-Original Les nouvelles méthodes d’activation pour l’entreprise (licence en volume) Clé KMS Clé MAK © 2006 Microsoft Corporation. All rights reserved. Microsoft, Windows, Windows Vista and other product names are or may be registered trademarks and/or trademarks in the U.S. and/or other countries. 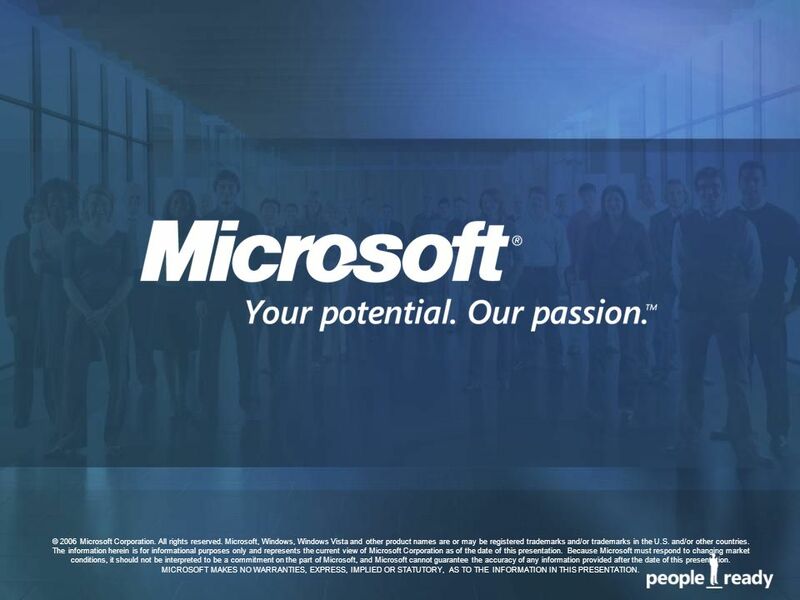 The information herein is for informational purposes only and represents the current view of Microsoft Corporation as of the date of this presentation. Because Microsoft must respond to changing market conditions, it should not be interpreted to be a commitment on the part of Microsoft, and Microsoft cannot guarantee the accuracy of any information provided after the date of this presentation. MICROSOFT MAKES NO WARRANTIES, EXPRESS, IMPLIED OR STATUTORY, AS TO THE INFORMATION IN THIS PRESENTATION. 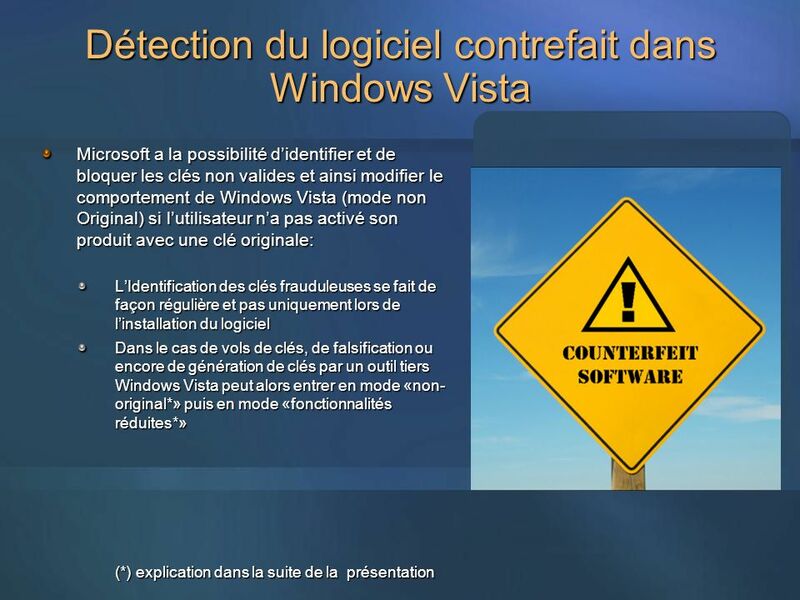 3/26/2017 3:54 PM Détection du logiciel contrefait dans Windows Vista Microsoft a la possibilité d’identifier et de bloquer les clés non valides et ainsi modifier le comportement de Windows Vista (mode non Original) si l’utilisateur n’a pas activé son produit avec une clé originale: L’Identification des clés frauduleuses se fait de façon régulière et pas uniquement lors de l’installation du logiciel Dans le cas de vols de clés, de falsification ou encore de génération de clés par un outil tiers Windows Vista peut alors entrer en mode «non-original*» puis en mode «fonctionnalités réduites*» (*) explication dans la suite de la présentation © 2006 Microsoft Corporation. All rights reserved. Microsoft, Windows, Windows Vista and other product names are or may be registered trademarks and/or trademarks in the U.S. and/or other countries. The information herein is for informational purposes only and represents the current view of Microsoft Corporation as of the date of this presentation. Because Microsoft must respond to changing market conditions, it should not be interpreted to be a commitment on the part of Microsoft, and Microsoft cannot guarantee the accuracy of any information provided after the date of this presentation. MICROSOFT MAKES NO WARRANTIES, EXPRESS, IMPLIED OR STATUTORY, AS TO THE INFORMATION IN THIS PRESENTATION. 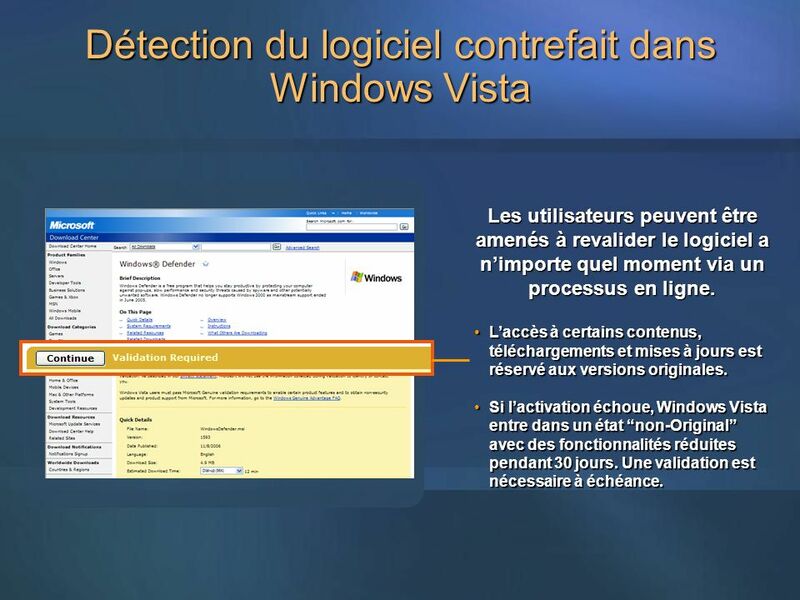 3/26/2017 3:54 PM Détection du logiciel contrefait dans Windows Vista Les utilisateurs peuvent être amenés à revalider le logiciel a n’importe quel moment via un processus en ligne. L’accès à certains contenus, téléchargements et mises à jours est réservé aux versions originales. 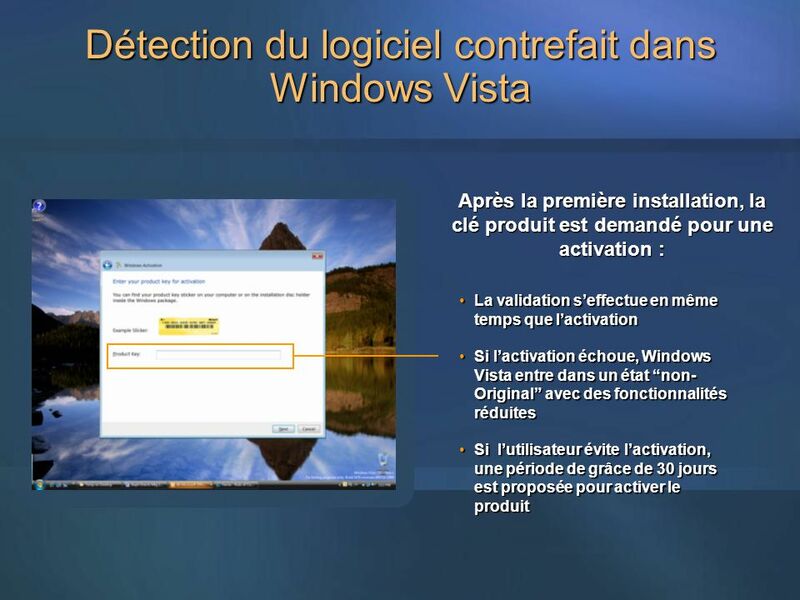 Si l’activation échoue, Windows Vista entre dans un état “non-Original” avec des fonctionnalités réduites pendant 30 jours. Une validation est nécessaire à échéance. © 2006 Microsoft Corporation. All rights reserved. Microsoft, Windows, Windows Vista and other product names are or may be registered trademarks and/or trademarks in the U.S. and/or other countries. The information herein is for informational purposes only and represents the current view of Microsoft Corporation as of the date of this presentation. Because Microsoft must respond to changing market conditions, it should not be interpreted to be a commitment on the part of Microsoft, and Microsoft cannot guarantee the accuracy of any information provided after the date of this presentation. MICROSOFT MAKES NO WARRANTIES, EXPRESS, IMPLIED OR STATUTORY, AS TO THE INFORMATION IN THIS PRESENTATION. 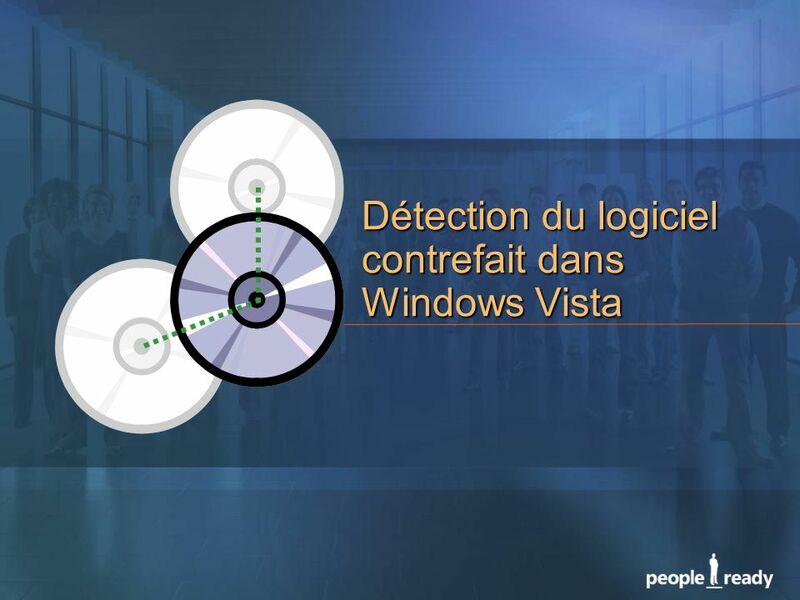 9 3/26/2017 3:54 PM Seul Windows Vista original apporte la performance et la tranquillité aux utilisateurs Nouvelles fonctionnalités Plus de sécurité Mises à jour logicielles Support de Microsoft et de ses partenaires *Seules les version Originales disposeront de toutes les fonctionnalités de Windows Defender © 2006 Microsoft Corporation. All rights reserved. Microsoft, Windows, Windows Vista and other product names are or may be registered trademarks and/or trademarks in the U.S. and/or other countries. 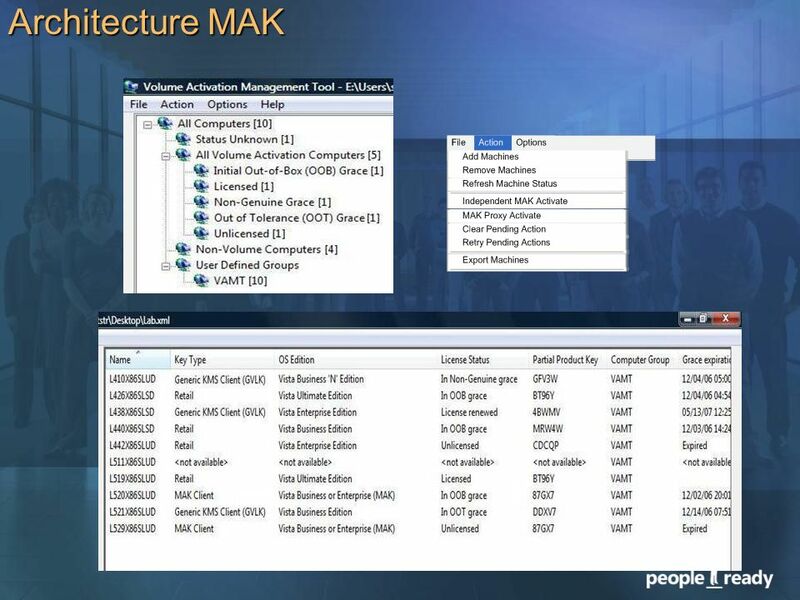 The information herein is for informational purposes only and represents the current view of Microsoft Corporation as of the date of this presentation. Because Microsoft must respond to changing market conditions, it should not be interpreted to be a commitment on the part of Microsoft, and Microsoft cannot guarantee the accuracy of any information provided after the date of this presentation. MICROSOFT MAKES NO WARRANTIES, EXPRESS, IMPLIED OR STATUTORY, AS TO THE INFORMATION IN THIS PRESENTATION. 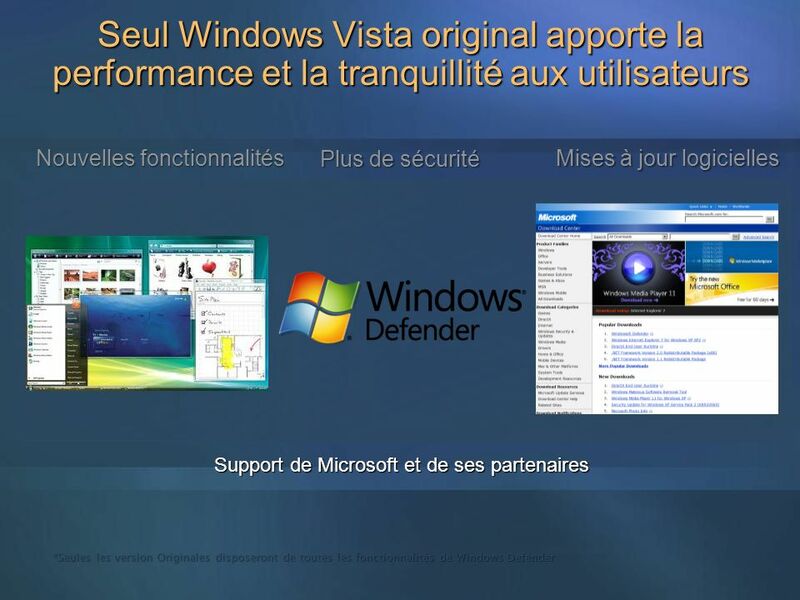 3/26/2017 3:54 PM Seul Windows Vista original apporte la performance et la tranquillité aux utilisateurs Windows Aero Windows ReadyBoost Plus de protection Nouvelle interface et navigation améliorée © 2006 Microsoft Corporation. All rights reserved. Microsoft, Windows, Windows Vista and other product names are or may be registered trademarks and/or trademarks in the U.S. and/or other countries. The information herein is for informational purposes only and represents the current view of Microsoft Corporation as of the date of this presentation. Because Microsoft must respond to changing market conditions, it should not be interpreted to be a commitment on the part of Microsoft, and Microsoft cannot guarantee the accuracy of any information provided after the date of this presentation. MICROSOFT MAKES NO WARRANTIES, EXPRESS, IMPLIED OR STATUTORY, AS TO THE INFORMATION IN THIS PRESENTATION. 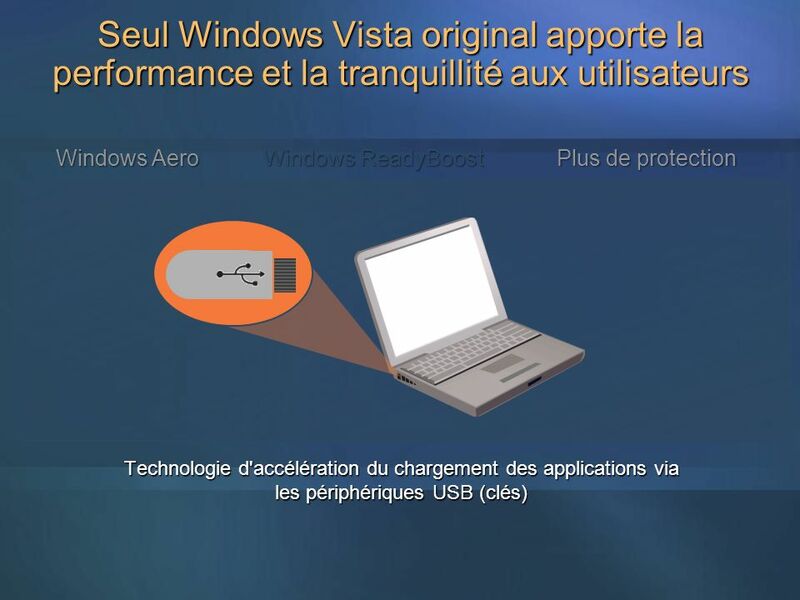 11 3/26/2017 3:54 PM Seul Windows Vista original apporte la performance et la tranquillité aux utilisateurs Windows Aero Windows ReadyBoost Plus de protection Technologie d'accélération du chargement des applications via les périphériques USB (clés) © 2006 Microsoft Corporation. All rights reserved. Microsoft, Windows, Windows Vista and other product names are or may be registered trademarks and/or trademarks in the U.S. and/or other countries. The information herein is for informational purposes only and represents the current view of Microsoft Corporation as of the date of this presentation. Because Microsoft must respond to changing market conditions, it should not be interpreted to be a commitment on the part of Microsoft, and Microsoft cannot guarantee the accuracy of any information provided after the date of this presentation. MICROSOFT MAKES NO WARRANTIES, EXPRESS, IMPLIED OR STATUTORY, AS TO THE INFORMATION IN THIS PRESENTATION. 3/26/2017 3:54 PM Seul Windows Vista original apporte la performance et la tranquillité aux utilisateurs Windows Aero Windows ReadyBoost Plus de protection 25% des sites Web offrant des clés produits contrefaites, des logiciels piratés, des générateurs de clés ou des outils de piratage tentent d’installer soit des logiciels malveillants ou des logiciels non sollicités*. *Etude tierce partie réalisée par International Data Corporation (IDC) © 2006 Microsoft Corporation. All rights reserved. Microsoft, Windows, Windows Vista and other product names are or may be registered trademarks and/or trademarks in the U.S. and/or other countries. The information herein is for informational purposes only and represents the current view of Microsoft Corporation as of the date of this presentation. Because Microsoft must respond to changing market conditions, it should not be interpreted to be a commitment on the part of Microsoft, and Microsoft cannot guarantee the accuracy of any information provided after the date of this presentation. MICROSOFT MAKES NO WARRANTIES, EXPRESS, IMPLIED OR STATUTORY, AS TO THE INFORMATION IN THIS PRESENTATION. 3/26/2017 3:54 PM Expérience utilisateur non-Original Si l’activation ou la validation échoue, le système entre dans un état “non-Original”. L’utilisateur a 30 jours pour activer son produit avec une clé produit originale . Une alerte s’affiche avec un compte à rebours pour activer le produit Une fenêtre permanente affiche le statut “non-Original” © 2006 Microsoft Corporation. All rights reserved. Microsoft, Windows, Windows Vista and other product names are or may be registered trademarks and/or trademarks in the U.S. and/or other countries. The information herein is for informational purposes only and represents the current view of Microsoft Corporation as of the date of this presentation. Because Microsoft must respond to changing market conditions, it should not be interpreted to be a commitment on the part of Microsoft, and Microsoft cannot guarantee the accuracy of any information provided after the date of this presentation. MICROSOFT MAKES NO WARRANTIES, EXPRESS, IMPLIED OR STATUTORY, AS TO THE INFORMATION IN THIS PRESENTATION. 3/26/2017 3:54 PM Expérience utilisateur non-Original Si l’activation ou la validation échoue le système entre dans un état « non-Original » Certaines fonctionnalités sont désactivées comme Windows Aero et Windows ReadyBoost. © 2006 Microsoft Corporation. All rights reserved. Microsoft, Windows, Windows Vista and other product names are or may be registered trademarks and/or trademarks in the U.S. and/or other countries. The information herein is for informational purposes only and represents the current view of Microsoft Corporation as of the date of this presentation. Because Microsoft must respond to changing market conditions, it should not be interpreted to be a commitment on the part of Microsoft, and Microsoft cannot guarantee the accuracy of any information provided after the date of this presentation. MICROSOFT MAKES NO WARRANTIES, EXPRESS, IMPLIED OR STATUTORY, AS TO THE INFORMATION IN THIS PRESENTATION. 3/26/2017 3:54 PM Expérience utilisateur non-Original Si l’activation ou la validation échoue le système entre dans un état « non-Original » Les informations présentes sur le PC peuvent être exposées a des risques tels que les logiciels, virus ou autres malware. © 2006 Microsoft Corporation. All rights reserved. Microsoft, Windows, Windows Vista and other product names are or may be registered trademarks and/or trademarks in the U.S. and/or other countries. The information herein is for informational purposes only and represents the current view of Microsoft Corporation as of the date of this presentation. Because Microsoft must respond to changing market conditions, it should not be interpreted to be a commitment on the part of Microsoft, and Microsoft cannot guarantee the accuracy of any information provided after the date of this presentation. MICROSOFT MAKES NO WARRANTIES, EXPRESS, IMPLIED OR STATUTORY, AS TO THE INFORMATION IN THIS PRESENTATION. 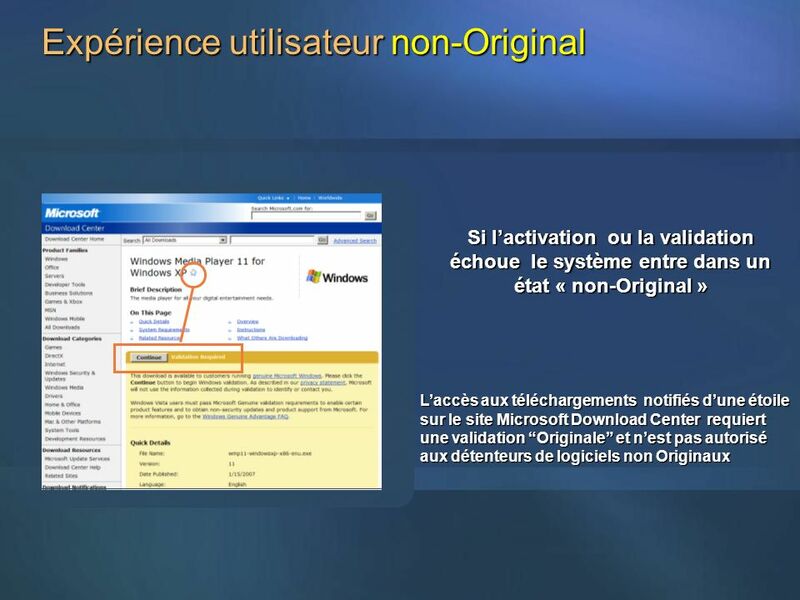 3/26/2017 3:54 PM Expérience utilisateur non-Original Si l’activation ou la validation échoue le système entre dans un état « non-Original » L’accès aux téléchargements notifiés d’une étoile sur le site Microsoft Download Center requiert une validation “Originale” et n’est pas autorisé aux détenteurs de logiciels non Originaux © 2006 Microsoft Corporation. All rights reserved. Microsoft, Windows, Windows Vista and other product names are or may be registered trademarks and/or trademarks in the U.S. and/or other countries. The information herein is for informational purposes only and represents the current view of Microsoft Corporation as of the date of this presentation. Because Microsoft must respond to changing market conditions, it should not be interpreted to be a commitment on the part of Microsoft, and Microsoft cannot guarantee the accuracy of any information provided after the date of this presentation. MICROSOFT MAKES NO WARRANTIES, EXPRESS, IMPLIED OR STATUTORY, AS TO THE INFORMATION IN THIS PRESENTATION. 3/26/2017 3:54 PM Expérience utilisateur non-Original Si l’activation ou la validation échoue le système entre dans un état « non-Original » Au bout des 30 jours, si l’utilisateur échoue lors de l’activation, le système basculera en mode « fonctionnalités réduites » RFM © 2006 Microsoft Corporation. All rights reserved. Microsoft, Windows, Windows Vista and other product names are or may be registered trademarks and/or trademarks in the U.S. and/or other countries. The information herein is for informational purposes only and represents the current view of Microsoft Corporation as of the date of this presentation. Because Microsoft must respond to changing market conditions, it should not be interpreted to be a commitment on the part of Microsoft, and Microsoft cannot guarantee the accuracy of any information provided after the date of this presentation. MICROSOFT MAKES NO WARRANTIES, EXPRESS, IMPLIED OR STATUTORY, AS TO THE INFORMATION IN THIS PRESENTATION. 3/26/2017 3:54 PM Expérience utilisateur non-Original Un échec d’activation après les 30 jours entrainera Windows Vista en mode « fonctionnalités réduites » RFM Fond d’écran noir Pas de menu démarrer ou de barre d’état Disponibilité de l’explorateur réduite Accès limité aux fichiers et aux dossiers © 2006 Microsoft Corporation. All rights reserved. Microsoft, Windows, Windows Vista and other product names are or may be registered trademarks and/or trademarks in the U.S. and/or other countries. The information herein is for informational purposes only and represents the current view of Microsoft Corporation as of the date of this presentation. Because Microsoft must respond to changing market conditions, it should not be interpreted to be a commitment on the part of Microsoft, and Microsoft cannot guarantee the accuracy of any information provided after the date of this presentation. MICROSOFT MAKES NO WARRANTIES, EXPRESS, IMPLIED OR STATUTORY, AS TO THE INFORMATION IN THIS PRESENTATION. 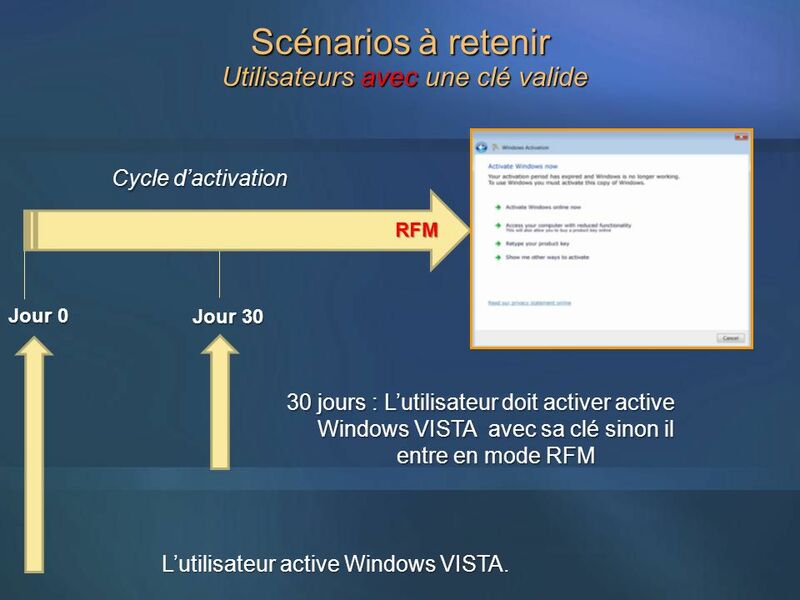 3/26/2017 3:54 PM Scénarios à retenir Utilisateurs avec une clé valide Cycle d’activation RFM Jour 0 Jour 30 30 jours : L’utilisateur doit activer active Windows VISTA avec sa clé sinon il entre en mode RFM L’utilisateur active Windows VISTA. © 2006 Microsoft Corporation. All rights reserved. Microsoft, Windows, Windows Vista and other product names are or may be registered trademarks and/or trademarks in the U.S. and/or other countries. The information herein is for informational purposes only and represents the current view of Microsoft Corporation as of the date of this presentation. Because Microsoft must respond to changing market conditions, it should not be interpreted to be a commitment on the part of Microsoft, and Microsoft cannot guarantee the accuracy of any information provided after the date of this presentation. MICROSOFT MAKES NO WARRANTIES, EXPRESS, IMPLIED OR STATUTORY, AS TO THE INFORMATION IN THIS PRESENTATION. 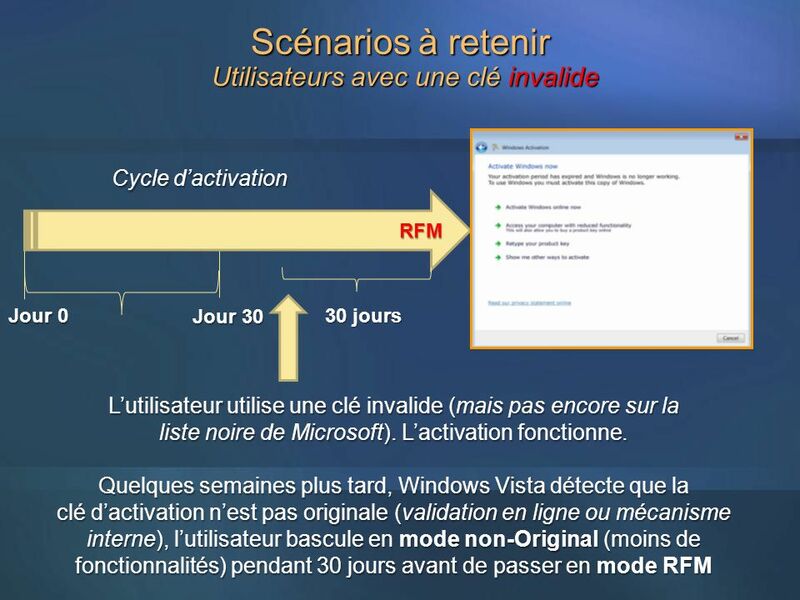 3/26/2017 3:54 PM Scénarios à retenir Utilisateurs sans une clé valide Cycle d’activation RFM Jour 0 Jour 30 30 jours : L’utilisateur doit obtenir une clé pour activer Windows Vista sinon il entre en mode RFM L’utilisateur installe Windows VISTA sans l’activer © 2006 Microsoft Corporation. All rights reserved. Microsoft, Windows, Windows Vista and other product names are or may be registered trademarks and/or trademarks in the U.S. and/or other countries. The information herein is for informational purposes only and represents the current view of Microsoft Corporation as of the date of this presentation. Because Microsoft must respond to changing market conditions, it should not be interpreted to be a commitment on the part of Microsoft, and Microsoft cannot guarantee the accuracy of any information provided after the date of this presentation. MICROSOFT MAKES NO WARRANTIES, EXPRESS, IMPLIED OR STATUTORY, AS TO THE INFORMATION IN THIS PRESENTATION. 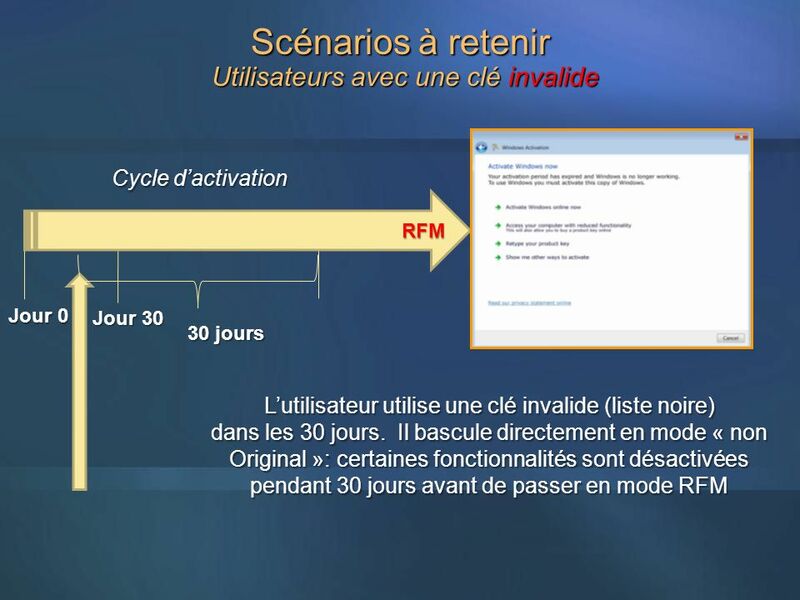 3/26/2017 3:54 PM Scénarios à retenir Utilisateurs avec une clé invalide Cycle d’activation RFM Jour 0 Jour 30 30 jours L’utilisateur utilise une clé invalide (liste noire) dans les 30 jours. 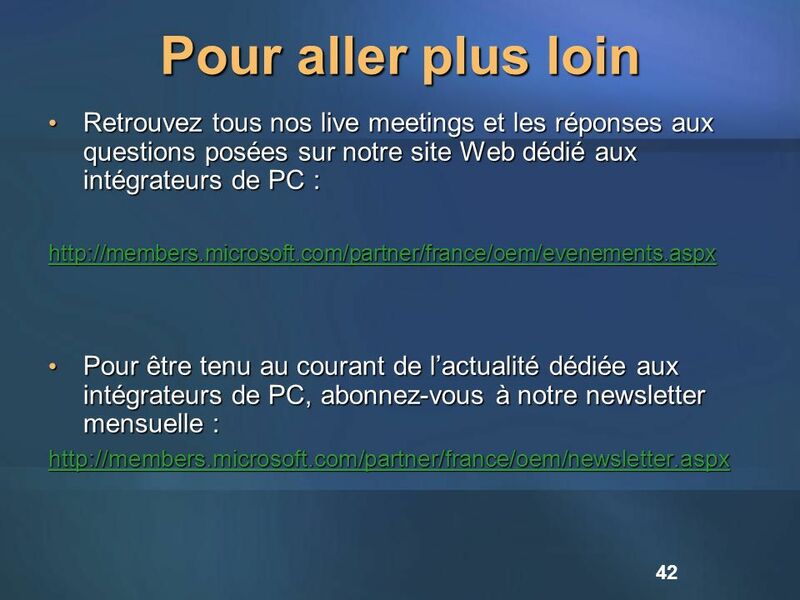 Il bascule directement en mode « non Original »: certaines fonctionnalités sont désactivées pendant 30 jours avant de passer en mode RFM © 2006 Microsoft Corporation. All rights reserved. Microsoft, Windows, Windows Vista and other product names are or may be registered trademarks and/or trademarks in the U.S. and/or other countries. The information herein is for informational purposes only and represents the current view of Microsoft Corporation as of the date of this presentation. Because Microsoft must respond to changing market conditions, it should not be interpreted to be a commitment on the part of Microsoft, and Microsoft cannot guarantee the accuracy of any information provided after the date of this presentation. MICROSOFT MAKES NO WARRANTIES, EXPRESS, IMPLIED OR STATUTORY, AS TO THE INFORMATION IN THIS PRESENTATION. 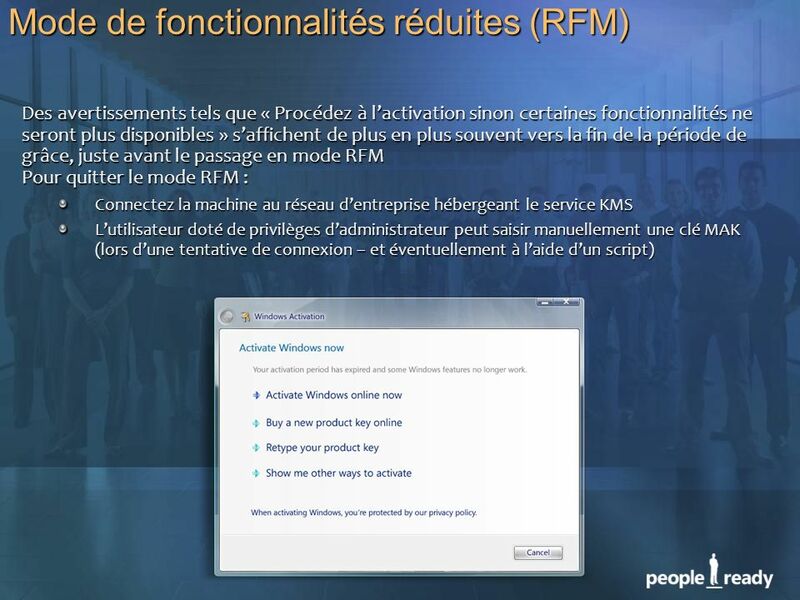 3/26/2017 3:54 PM Scénarios à retenir Utilisateurs avec une clé invalide Cycle d’activation RFM Jour 0 Jour 30 30 jours L’utilisateur utilise une clé invalide (mais pas encore sur la liste noire de Microsoft). L’activation fonctionne. 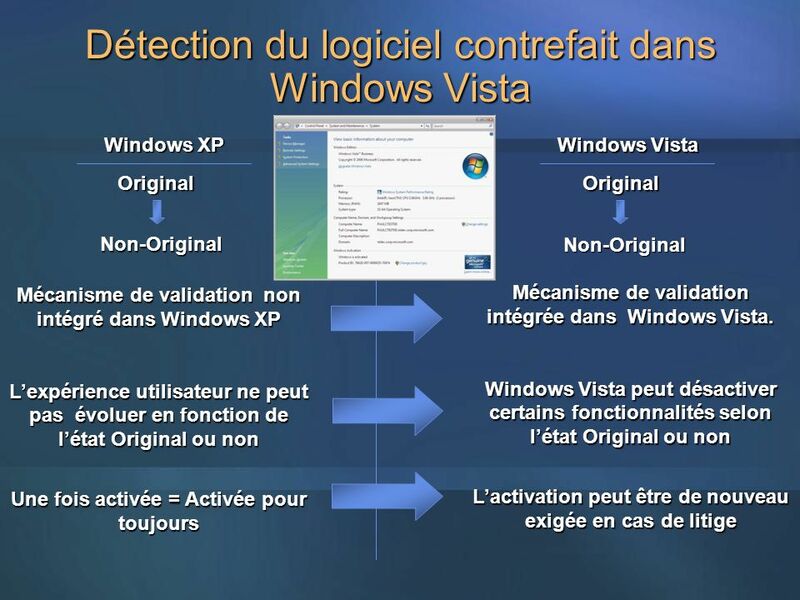 Quelques semaines plus tard, Windows Vista détecte que la clé d’activation n’est pas originale (validation en ligne ou mécanisme interne), l’utilisateur bascule en mode non-Original (moins de fonctionnalités) pendant 30 jours avant de passer en mode RFM © 2006 Microsoft Corporation. All rights reserved. Microsoft, Windows, Windows Vista and other product names are or may be registered trademarks and/or trademarks in the U.S. and/or other countries. The information herein is for informational purposes only and represents the current view of Microsoft Corporation as of the date of this presentation. Because Microsoft must respond to changing market conditions, it should not be interpreted to be a commitment on the part of Microsoft, and Microsoft cannot guarantee the accuracy of any information provided after the date of this presentation. MICROSOFT MAKES NO WARRANTIES, EXPRESS, IMPLIED OR STATUTORY, AS TO THE INFORMATION IN THIS PRESENTATION. Les clés MAK doivent être déployées sur chaque machine. Il est possible, pour cela, d’utiliser un script ou de faire figurer une MAK dans l’image Vista. Les MAK doivent être activées par MS une fois par machine, soit en ligne automatiquement, soit hors ligne à l’aide d’un ID de confirmation reçu par téléphone. Cet ID de confirmation peut servir plusieurs fois pour réactiver le même matériel. 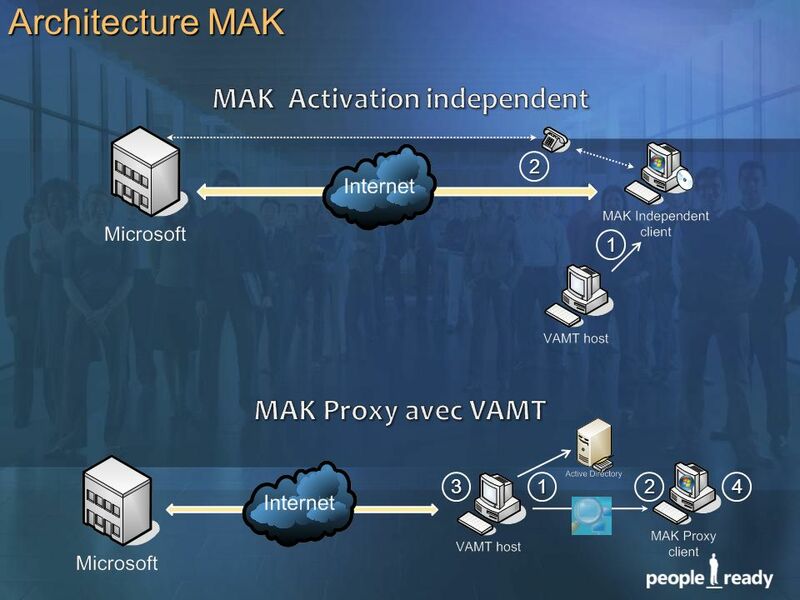 Un administrateur peut configurer l’activation automatique des MAK. 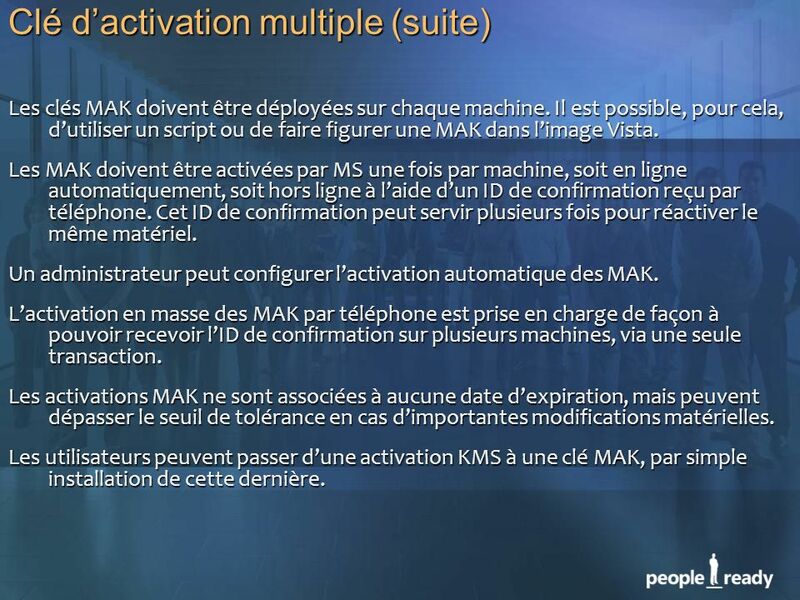 L’activation en masse des MAK par téléphone est prise en charge de façon à pouvoir recevoir l’ID de confirmation sur plusieurs machines, via une seule transaction. 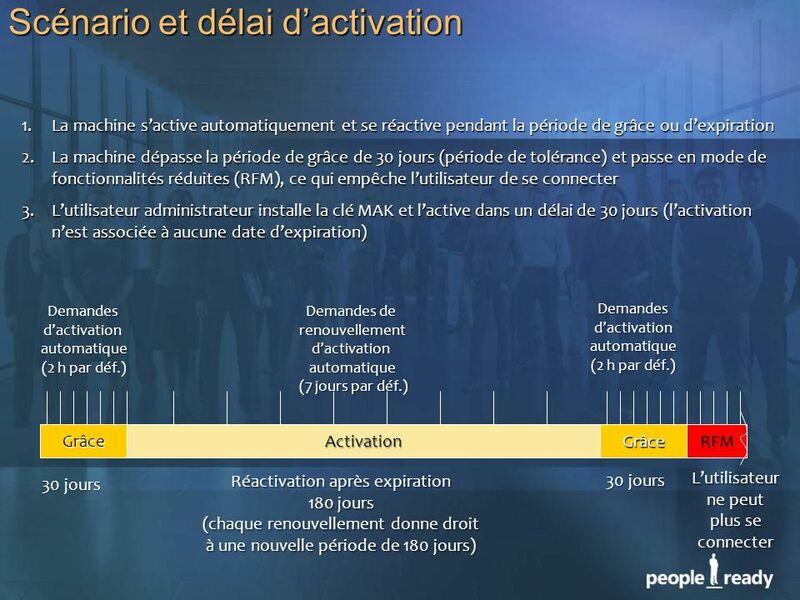 Les activations MAK ne sont associées à aucune date d’expiration, mais peuvent dépasser le seuil de tolérance en cas d’importantes modifications matérielles. 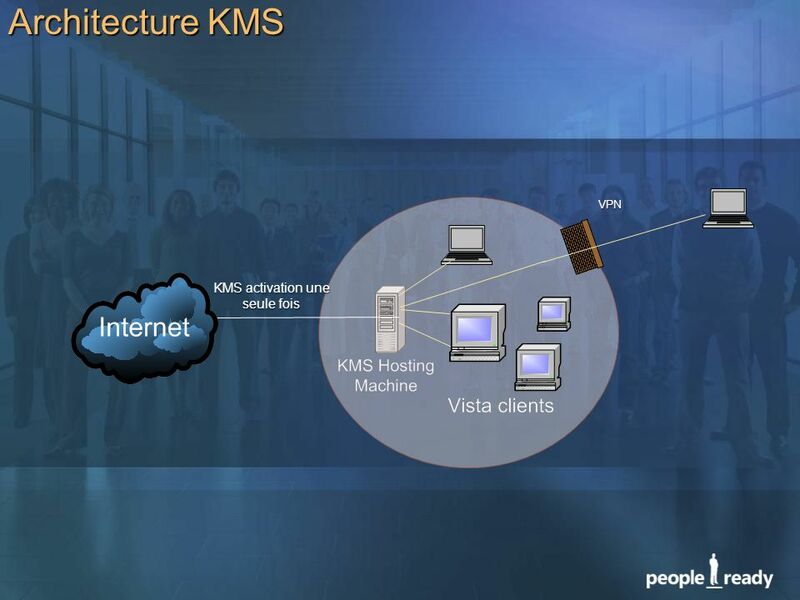 Les utilisateurs peuvent passer d’une activation KMS à une clé MAK, par simple installation de cette dernière. 41 Questions fréquentes En quoi le coût total de possession est-il affecté ? L’impact sur le coût total de possession varie en fonction de la configuration du réseau de l’entreprise. Généralement, l’impact reste très faible puisque aucune infrastructure/administration supplémentaire n’est requise. Dans bien des cas, les fonctions de gestion d’actifs intégrées à VLK 2.0 compensent largement les coûts de gestion informatique occasionnés. Aucun nouveau matériel n’est requis. 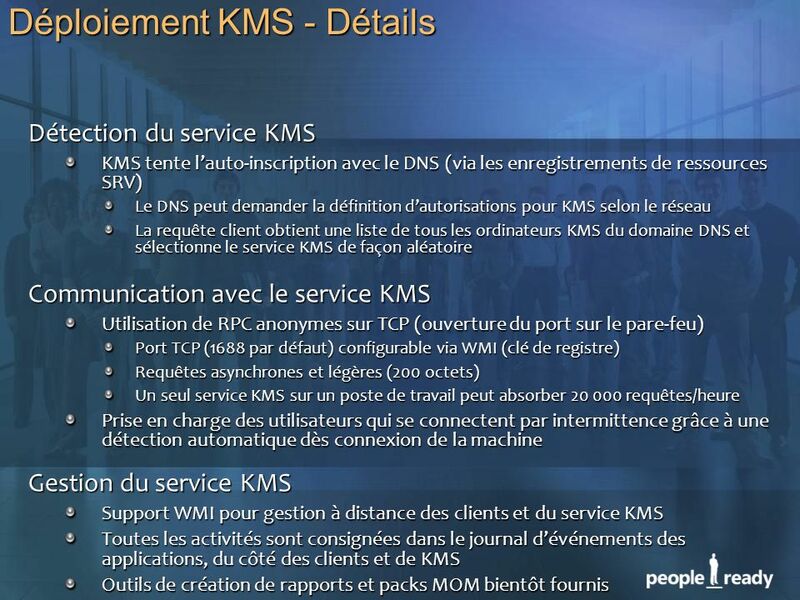 KMS est léger et cohabite avec d’autres services. Quelles sont les éditions en volume compatibles avec KMS ? 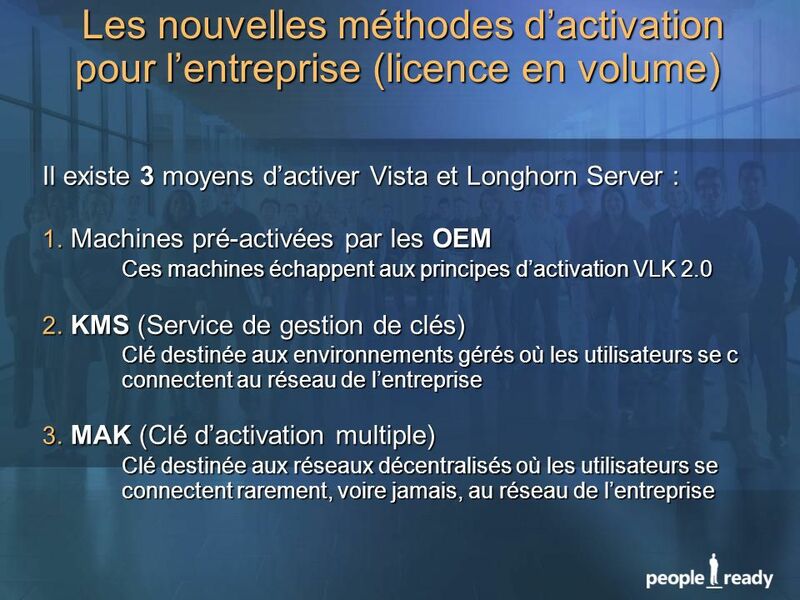 Client Professionnel, Client Entreprise, Serveur Entreprise Les versions clientes sont uniquement des mises à jour. Pourquoi la valeur « n » est-elle fixée à 25 machines ? Des études poussées et les réactions de nos clients ont montré qu’un réseau de 25 machines constitue un juste équilibre entre le confort d’utilisation et la prévention de réseaux illégaux. Les entreprises dotées de réseaux de moins de 25 machines auront recours aux clés MAK. N’est-ce pas pour Microsoft l’occasion d’accroître ses revenus ? Si la lutte contre le piratage des logiciels Windows profite à Microsoft, aucune entreprise ne peut approuver l’utilisation illégale de ses clés de licence en volume. Les clients de Microsoft sont surtout les premiers à bénéficier d’une sécurité renforcée et d’un compte précis de leurs clés et logiciels de licence en volume. 43 3/26/2017 3:54 PM © 2006 Microsoft Corporation. All rights reserved. Microsoft, Windows, Windows Vista and other product names are or may be registered trademarks and/or trademarks in the U.S. and/or other countries. The information herein is for informational purposes only and represents the current view of Microsoft Corporation as of the date of this presentation. Because Microsoft must respond to changing market conditions, it should not be interpreted to be a commitment on the part of Microsoft, and Microsoft cannot guarantee the accuracy of any information provided after the date of this presentation. MICROSOFT MAKES NO WARRANTIES, EXPRESS, IMPLIED OR STATUTORY, AS TO THE INFORMATION IN THIS PRESENTATION. © 2006 Microsoft Corporation. All rights reserved. Microsoft, Windows, Windows Vista and other product names are or may be registered trademarks and/or trademarks in the U.S. and/or other countries. The information herein is for informational purposes only and represents the current view of Microsoft Corporation as of the date of this presentation. Because Microsoft must respond to changing market conditions, it should not be interpreted to be a commitment on the part of Microsoft, and Microsoft cannot guarantee the accuracy of any information provided after the date of this presentation. MICROSOFT MAKES NO WARRANTIES, EXPRESS, IMPLIED OR STATUTORY, AS TO THE INFORMATION IN THIS PRESENTATION. 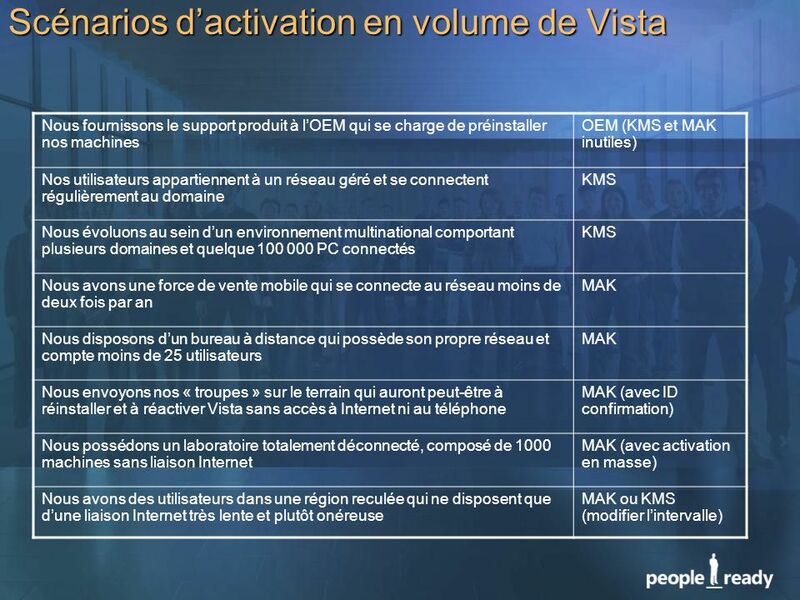 Télécharger ppt "Les nouveautés de l’activation"